The weather in spring is usually a mix of a day's rain followed by 4-5 days of sun. The last weekend though we had almost four-five rainy days on the trot. It doesn't stop us walking, but it does mean we keep the walks shorter and closer to home, and the wet weather doesn't help with photos. To make up for the rain, May Day was back to glorious blue sky and sunshine, and combined with the wet ground meant that it almost felt like we could see the grass and flowers growing. In places it was like an impressionist painter had thrown splashes or yellow and red paint across the fields. 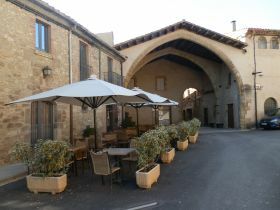 Canapost is a small village not far from La Bisbal and Peratallada, and like Peratallada it is built of the rich golden stone of the area. It's not big - about two or three streetsworth of houses, but it has a delightful small church (Sant Esteve). We parked in the centre of the village. Some local children were trying to profit from the sunshine by selling lemonade along the street in a little hand-made stall. The path though takes us out across the Peratallada road and out towards the Bobilla (brickworks) factory. The wet weather meant both the fields seem to have grown 10-20cm in the last week. What was burgeoning stalks are now ears of wheat and barely waiting to be sun dried. Along the edge, hundreds of poppies make blush red edges to the field, alternating with the mauve flowers of borage and the bright yellow of a host of other flowers. The path splits and we take the right fork, the left heading towards the brickworks and the factory disappears behind a hill. The map is not clear as to whether there is a connecting route so we're taking a little bit of a chance and as we carry on, we're met by a gate and driveway entrance for a house directly in front of us. There's a path to the left that seems to skirt the house's paddock and looks as if it's used for biking or bmxing. The path continues up the hill behind the brickworks, practically to the top, but with no obvious fork in the direction we want to go. Eventually it stops at the wall of a bank. Having no where else to try, we scramble up the bank and find a new path along the ridge of the hill. It's by no means clear if this is a legitimate path, but something or someone does use it and we continue across the ridgetop to a field which has views out to the coast and the Isles Medes and all the way up to Empuriabrava and Albons in the distance. From the field we join what seems to be a more valid track out past an olive grove. The birds around seem to be in full conversation. In the quiet location, it's almost like being serenaded by a songbird choir. The path emerges close to Ullastret. Our intention is to go into the village, but first to take in the Poblet Iberic (Iberian Village) of Ullastret which sits a little way off from the current modern village. 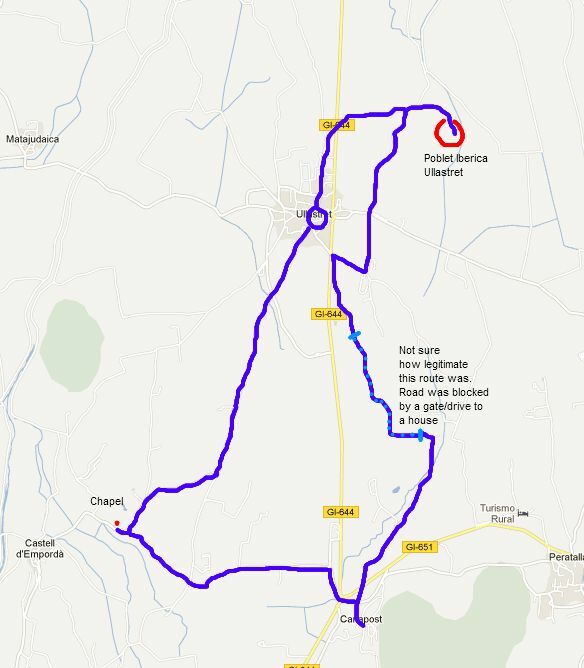 So instead of taking the road into the centre, we head the opposite direction past some houses, before finding the first track that takes us to the left towards the Poblet, across a bigger road and then out towards the hill on which the Poblet stands. From the track you don't see anything of the Iberian village until you get to the end, and see the car park. The gates were open and entry was free (at some times of the year you have to pay to go in). The Ibers were Bronze age peoples of Spain (hence the Iberian peninsula) before the Romans and around the Empordan region there are a number of Iberic ruins. For example just above Platja de Castell and at the Farde San Sebastian lighthouse above Llafranc. The village at Ullastret is built on a hill, which would have been above the lake of Ullastret (see the walk from Gualta). From the entrance you walk past an impressive defensive wall, which according to the signs was built in around the 6th and 7th Centuries BC - though it looks medieval in layout and stonework. 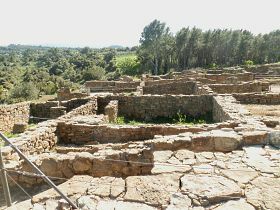 The main part of the Iberic village is a little higher up), though all that remains are the foundations and building layout. It has views in all directions and a museum (closed when we were there) and it is worth visiting just for the views and to take in the location. From the Iberic village we walk along the road and into Ullastret. As you come into the heart of the current village the first things that greet you are the old buildings of the medieval hospital and the stone wall complete with two towers - one square and one circular that would have guarded the inner houses, and inside the village walls are a nestle of streets and a romanic church - another of the very pretty villages that surround La Bisbal. 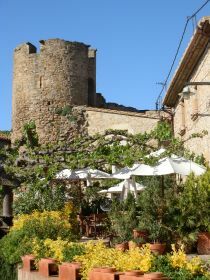 We head out of the village on the Cami de Castell d'Emporda. 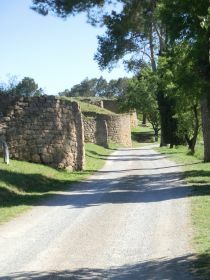 The route which would have taken ancient travellers towards the castle of Emporda and then onwards to La Bisbal. The road is tarmacked, but very quiet with views to the west to the Pyrenees, still carrying snow, but getting hazier as the days turn to summer. 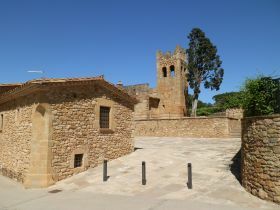 The road passes a small hill to the right, then there are the first views of the Castell d'Emporda on its promentary point, but the view is marred slightly by the pig-farm and the sound of squealing pigs. Along the road we get to a junction. We're going left back towards Canapost, but just to the left is the small chapel of St Marti de Llaneres. We return to the path and past the fields and an old masia. Canapost is nestled in the hill ahead with the Gavarres to the right and we return to the car. Homemade lemonade would have been wonderful as we were low on water, but unfortunately the children have packed up for the afternoon.